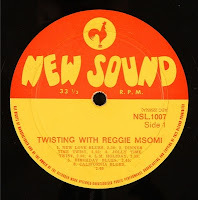 Reggie Msomi was a prolific writer who drew upon and fused multiple cosmopolitan influences into a sound that must have energised Western and African audiences alike. 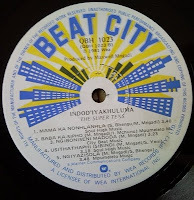 While having its distinct South Africa flavour, this fusion of jazz, jive, ska and twist would – if it had been so distributed - most likely have filled sixties dance-floors from Kingston to Kinshasa – from New York via London back to New Orleans. Thanks again to artist and collector extraordinaire Siemon Allen for sharing these rarities with ElectricJive. If you have not yet done so – do yourself the favour of giving Siemon’s flatinternational site a browse, starting here. 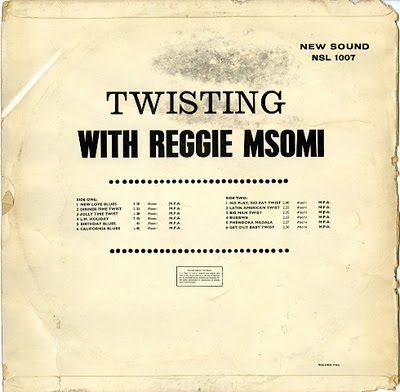 Mbaqanga may have paid the bills, but for Reggie Msomi and quite a few other talented 1970s South African musicians, jazz and soul were their first love. A relatively small buying public meant that some strong music was being overlooked by the record companies. 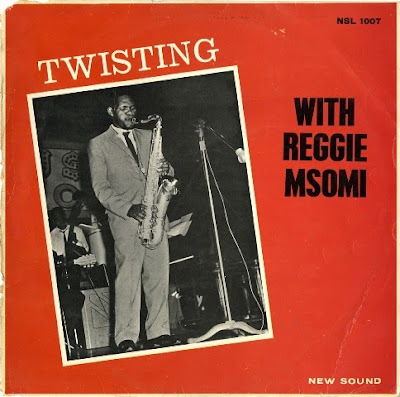 With a big reputation in the industry as a consumate musician, talent scout, band-leader, writer, arranger and producer, Msomi managed to record this eclectic and now rare collection of his own soul, jazz and even marabi-tinged compositions – recorded as a Mavuthela Production two weeks before the Soweto uprisings in June 1976. 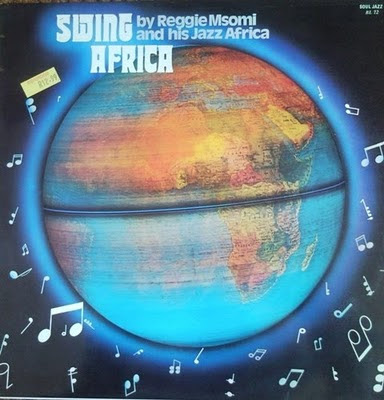 Do yourself a favour – sit down and listen to “Swing Africa”, or better still, stand up and Swing Africa - some jazz, lots of soul, but essentially South African! 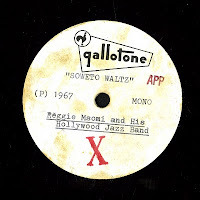 Reggie Msomi formed and led the Hollywood Jazz Band in 1962. He wrote scores of hits for big stars, including Miriam Makeba. 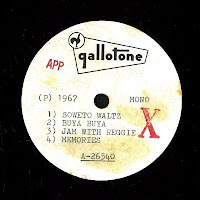 One of his bands' own hits that has endured in current compilations is "Midnight Ska", a great sixties ska number which can be downloaded here. 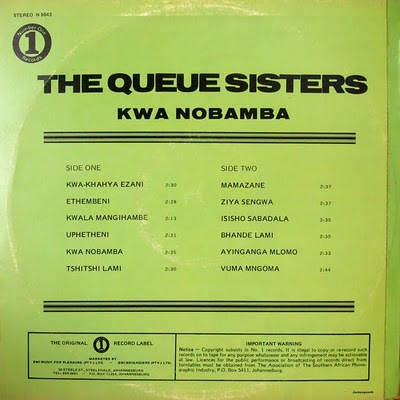 In the early seventies Msomi was also band leader of the Flying Jazz Queens, a popular Mbaqanga group. “Reggie was born at Frankland KwaQwabe the Ngunis, along the South Coast, Port Shepstone, Natal. He grew up like all other African Boys, first herded cattle then went to school. He started his music career at an early age, when he made his own guitar with a gallon tin a wooden handle and three ordinary wire strings. He was only ten years of age when he was playing his hand-made guitar, entertaining beer-drinking older men. In 1953 Reggie left Natal for Johannesburg seeking work in the gold mines as a male nurse in the mine hospital. “He bought himself an electric guitar whilst employed by the mines. After a year’s service he left the mines and worked for the Turf Club as a groom boy. There he played for the people of Magaba Njegabane. “The following year he joined a recording company known as RCA where he met people like Chuks Chukudu, bass player; Stanford Tsiu, guitarist; Christopher Songxaka on tenor saxophone. 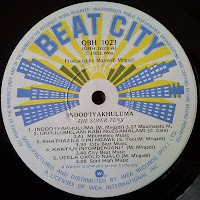 Later he joined Gallo Africa where he made best-selling records composed by himself, some of them he recorded with famous stars like Miriam Makeba, Manhattan Brothers, Lemmy Special Mabaso; The Sky Larks and the late Spokes Mashiyane. “Most of the songs played by Spokes were composed by Reggie who also played a guitar. They were then under talent scout, the late Sam Alcock. In 1960 Reggie was now playing a saxophone. He then recorded a song titled “Dinner Time Twist” which he composed. In 1962 he was appointed as a talent scount for Gallo Africa. During the same year he formed his own band known as the “Hollywood Jazz Band” which took part in the Batfire Trade Fair in South Africa. In 1965 he toured Rhodesia and Zambia with his band. 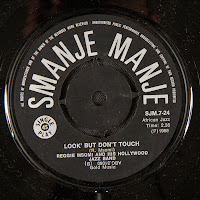 In 1966 he joined Mr R. Bobpape together with the Mahotella Queens and Makgona Tsohle Band. No further information on the other musicians. The Super Tens herald further wishes for a "super" 2010 to all ElectricJive readers! This year’s third instalment of electric jive is a double-dose straying into the early 1980s and to a highly popular all-male band dispensing an increasingly sophisticated and rounded mbaqanga, re-introducing some marabi jive, but also flagging a taste of future 80s sounds. 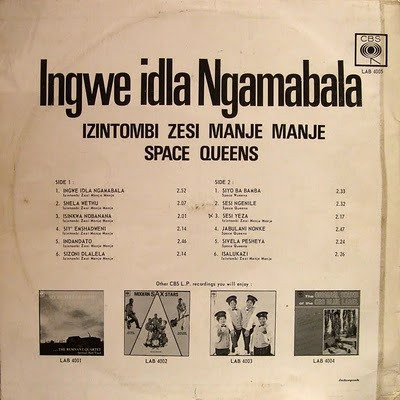 Fronted by three tight saxophones (including Lemmy 'Special' Mabaso), the honey-smooth vocal harmonies, funky keyboards, and a pinch of synth, glide along to a strong mbaqanga drum and bass foundation. 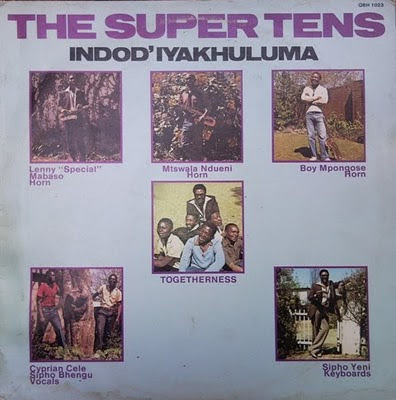 EJ reader Gordon O’s request for the Super Tens got me digging out these two LPs bought at the store that traded in traditional medicine, plastic buckets and African music LPs at the top-end of Church Street next to Pietermaritzburg Central Railway Station in the early 1980s. 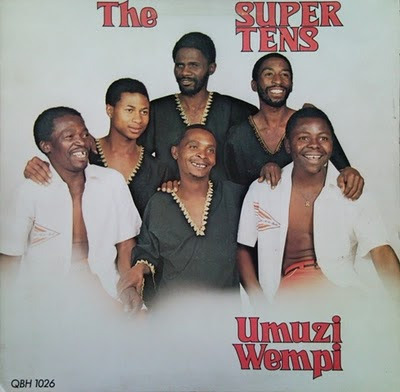 Named after the first wave of 1970s ten-seater taxis, ‘The Super Tens’ spoke deeply to migrant workers - a pervasive beerhall sound-track, pulsing from straining speakers in the doorways of furniture and clothing stores across downtown urban South Africa. On “Indod’Iyakhuluma” - the band has a third sax player in ‘Boy Mpongose’. Sipho Yeni plays keyboards. 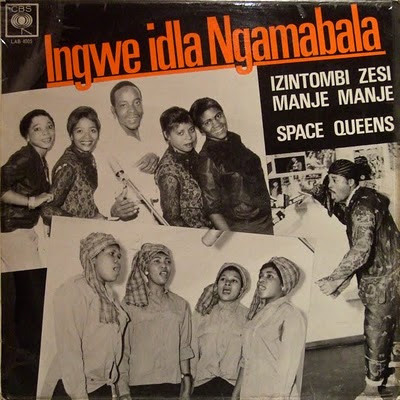 Sharp on the heels of Izinthombi Zesi Manje Mange and the Space Queens comes another dose of electric jive. This time from the Queue Sisters. 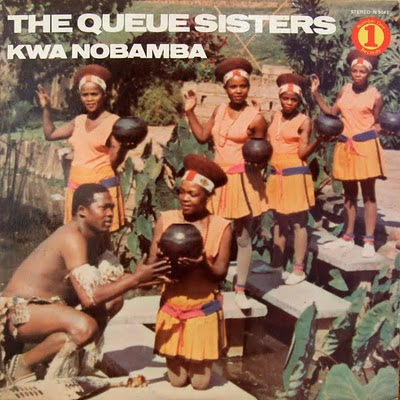 Kwa Nobamba is an area close to the Zulu Royal Kraal at Ulundi and the cover image gives prominence to the beer pot, an item then found in every Zulu household and symbolic both as a receptacle of heritage and of a spirit of togetherness.